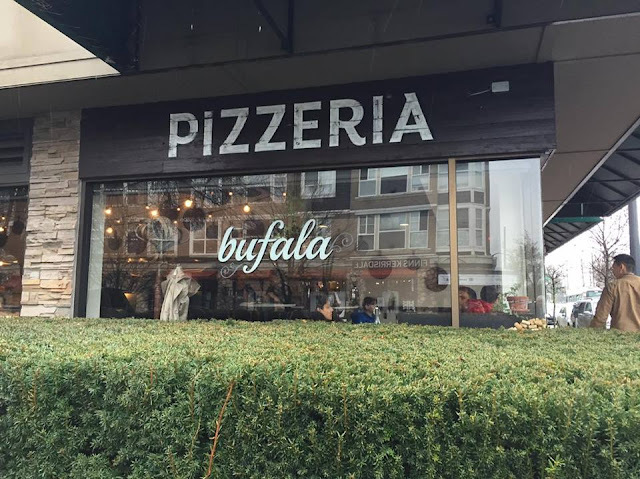 For my last Dine Out Vancouver Festival of 2016, I checked out Bufala in Kerrisdale with MH and MW. 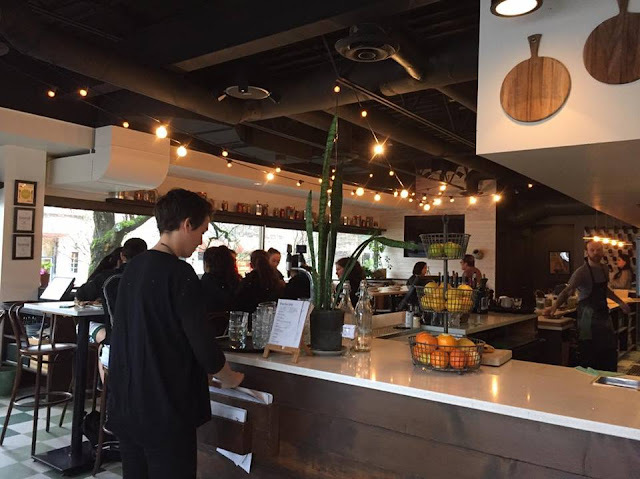 They offered a lunch menu for $20 for two courses or $25 for three courses. Since the lunch price is cheaper than dinner for the same menu items, it was a better deal to visit at lunch. They didn’t take reservations for Dine Out, but the restaurant wasn’t super busy on a Saturday, so we got a seat right away. We were able to order off their regular menu during the festival as well. 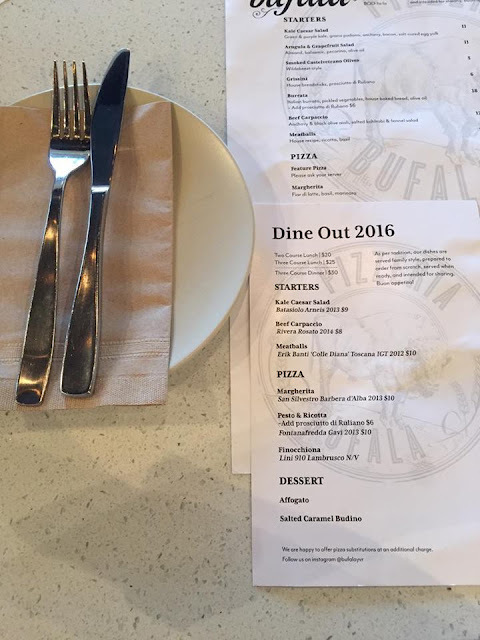 However, their dine out menu pizzas ranged from $14-17 anyways, so the dine out menu was a pretty good deal. We ended up being able to try all their dine out menu items since we had three people. 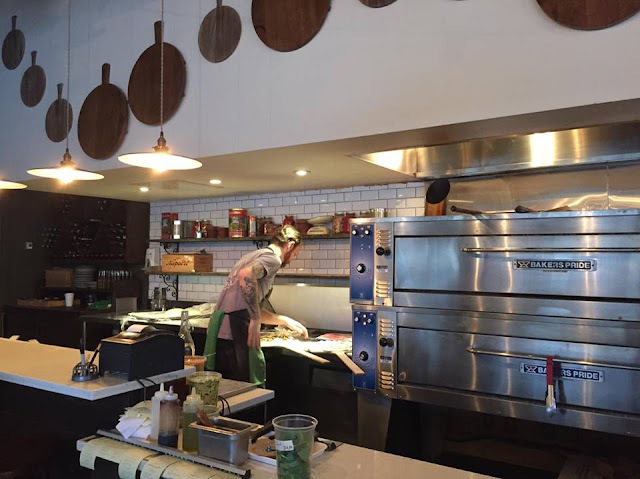 They don’t use a wood oven here, but they still make the pizzas fresh. Love the fun and bright decor in here. 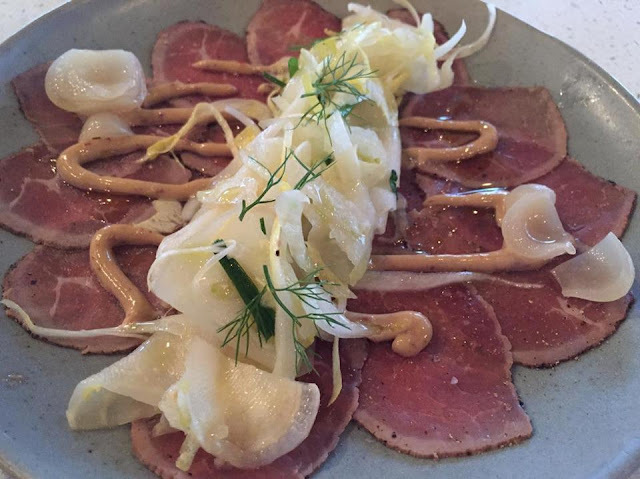 The first appetizer was the Beef Carpaccio which were topped with fennel and salted kohlrabi, a type of turnip cabbage. It was also drizzled with an anchovy and black olive aioli. I found it slightly on the saltier side and the beef stuck together a lot for some reason. It was alright. 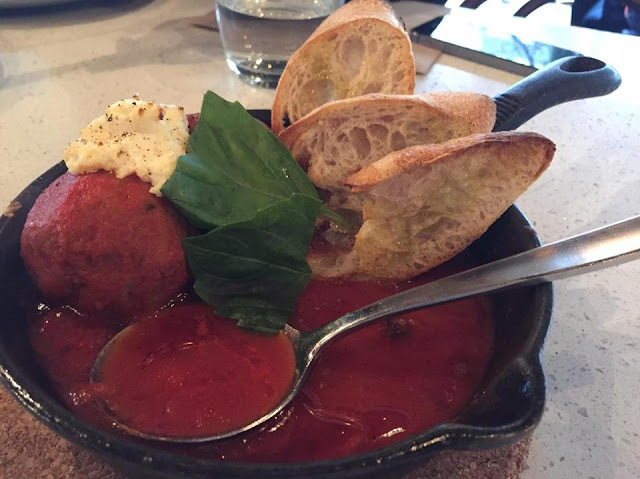 Their famous Meatballs were my favourite appetizer. It came with ricotta cheese, basil leaves, and some bread to soak up the tasty homemade tomato sauce. These were large meatballs but very moist! The sauce was also very flavourful with the right amount of acidity. 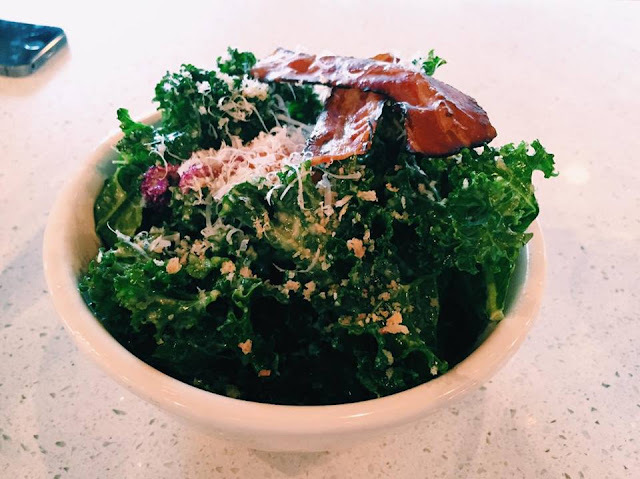 The Kale Caesar Salad was also very delicious with the green and purple kale seasoned with anchovy and topped with Parmigiano Reggiano. It was also topped with a couple of slices of crispy bacon and a salt-cured egg yolk. The kale was fresh and crispy and I loved the use of the egg yolk. 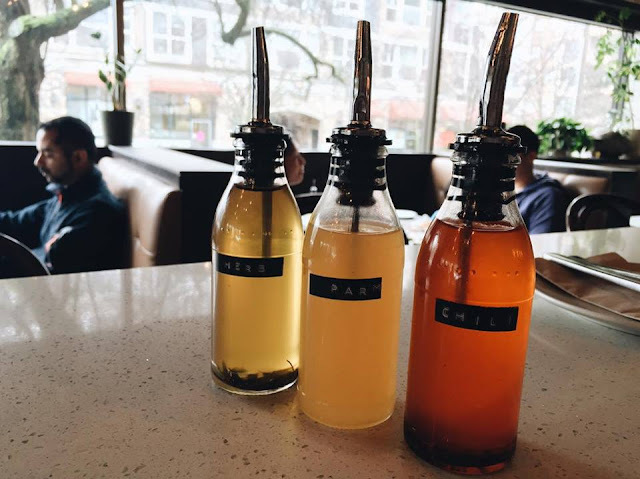 Before our pizzas arrived, the server brought us three oils to use along with our pizza. This included the herb, parm, and chili oil. We were told to drizzle some on our plate and dip our pizza into it rather than drizzling straight onto our pizza. However, we found that the oils were not very strong in flavour. The herb oil was the only one that we could really taste the rosemary. I ended up eating the pizza on its own since it was already very flavourful. 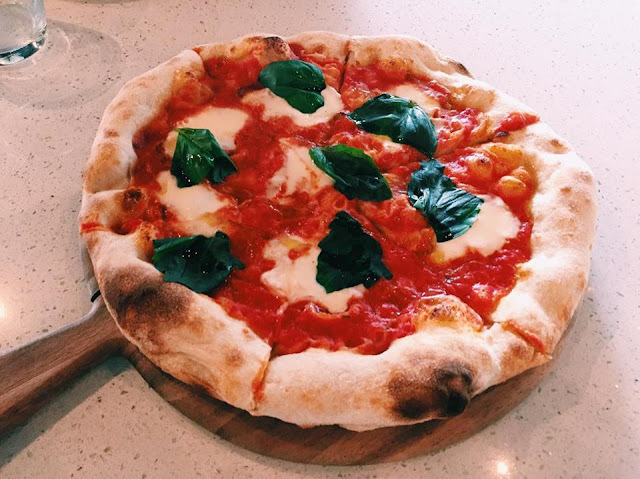 The first pizza we had was the classic Margherita Pizza. 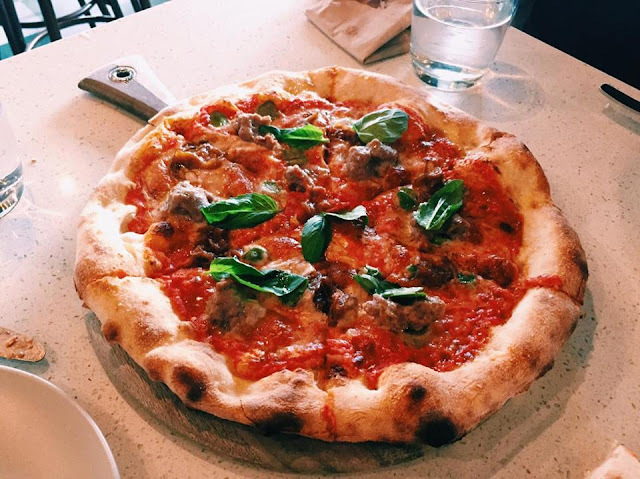 A beautiful marinara sauce topped with basil and fior di latte. Fior di latte is made of cow’s milk rather than water buffalo which is more costly. However, the mozzarella was still extremely stringy and I enjoyed the cheese very much. Next up was the Pesto & Ricotta Pizza Basil Pesto of which we added an additional $5 to add prosciutto. 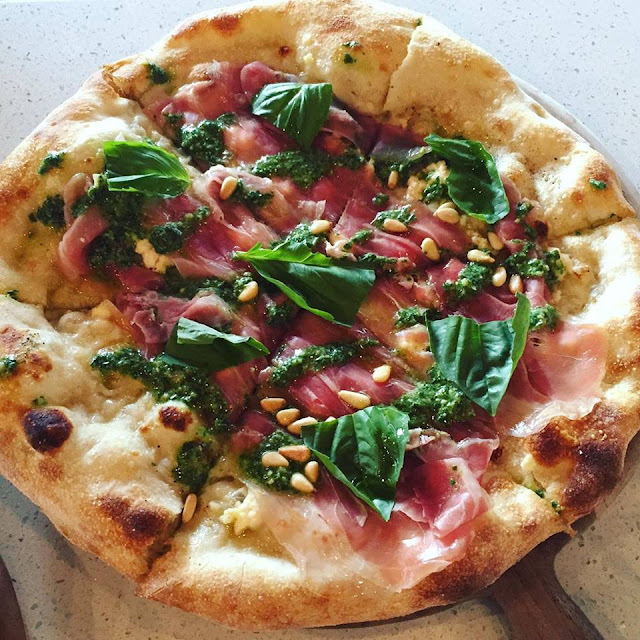 In addition, the pizza was topped with fresh ricotta, pine nuts, Grana Padano cheese, and pesto. Loved the flavours of this pizza and I think the salty prosciutto really added flavour to it. The last pizza was the Finocchiona. This had a marinara sauce with fennel sausage, Castelvetrano olives, carmelized onions, provolone cheese and basil leaves. This is perfect for those who are meat lovers. 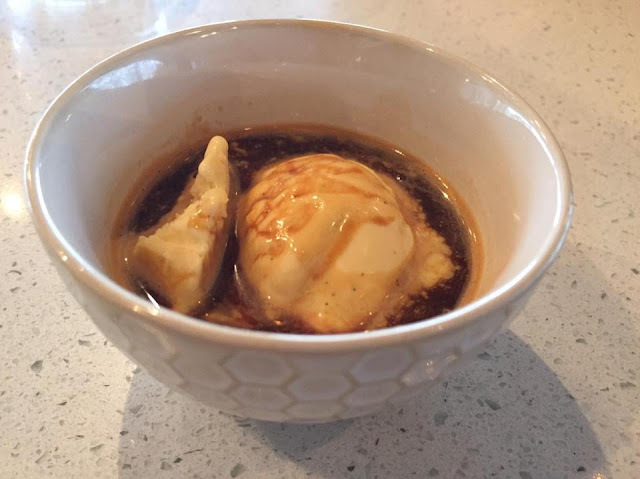 The Classic Affogato featured a vanilla bean gelato soaked in a single origin espresso. You can never go wrong with an affogato for dessert! 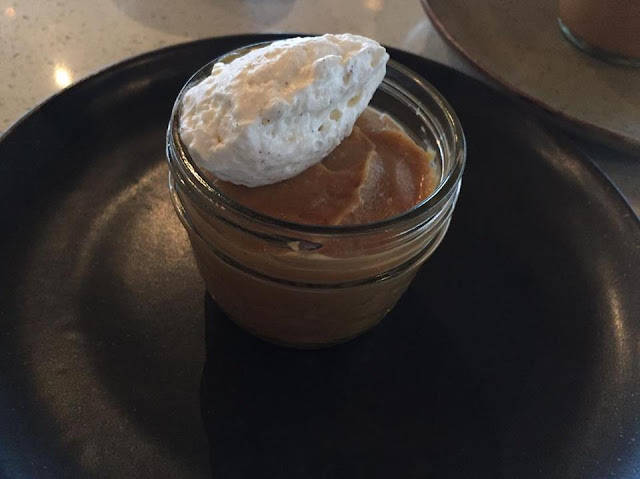 I tried the Salted Caramel Budino which came in a jar. This was topped with a vanilla bean Mascarpone cream and Maldon sea salt. The budino was smooth and not overly sweet. Overall, we were quite pleased with Bufala. The pizzas are thin crusted, fluffy, and crispy. Large portions and their meatballs and kale salad are delicious! Service was pretty friendly with our server extremely proud of the dishes.